We don’t like to admit it, but even dedicated yogis occasionally have difficulty keeping up with their regular practice. None of us are immune to the hectic pace of modern life, and daily responsibilities always have the potential to disrupt even the best intentions. It is essential for any student of yoga to have a home yoga practice. Why, you may ask? You can practice any time, anywhere, for any duration. There’s no feeling of self-consciousness or competition against fellow students. You can figure out what feels good to you. Attending yoga classes is great, but it’s better to think of yoga class as “yoga lab”, where you fine-tune your bodily instrument and learn new tricks that you can take home with you. Home is where your true practice lives. 1. Create a space for your yoga practice. If you have an entire room that you can turn into your own private yoga studio, that’s fantastic! However, all you really need is a space large enough for you to spread out without bumping into things. Find a comfortable, peaceful spot in your room, apartment, or house that you can devote solely to yoga. Keep the area clean and free of clutter and non-yoga-related items – it will be much easier to begin practice if you can just plop down without having to move things around first. Also, consider including some wall space in your yoga spot. You can use the wall as a prop for certain poses. Seated meditation is often hard on the back for the inexperienced, but it becomes a joy when you can sit with your back against the wall – and it helps you remember not to slouch over! The wall is also a fantastic prop for standing balance poses – hold on with your hand while practicing tree pose, or rest your back foot on the wall during half moon. Use the wall as a prop! Viparita karani, aka legs-up-the-wall pose (pictured above), is a restful pose that promotes healthy circulation. 2. Create a “yoga atmosphere”. Make your yoga space as pleasant and inviting as possible, so that it becomes a place you want to be. Some people prefer their yoga space to be completely empty to minimize distractions. Others like to decorate their space with images and objects that are motivational or inspirational. Some ideas of atmospheric elements to include are: candles, incense, an aromatherapy diffuser, a small statue, prayer flags, an altar, crystals, and plants. Many yogis also enjoy listening to music or recordings of nature sounds while they practice – and if you live in a noisy household, music can be especially helpful as it blocks out intrusive sounds. 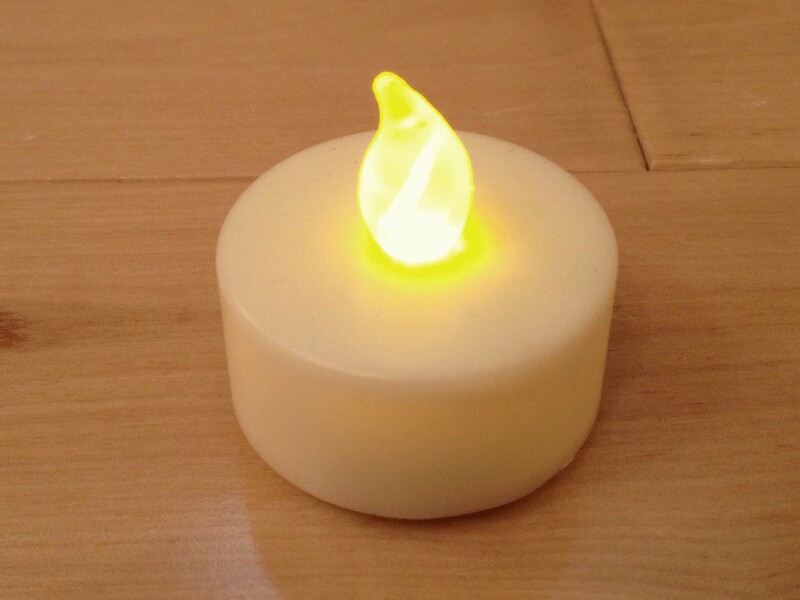 Use an electric tea light to get the same ambience as a candle, but without the fire hazard. All of these things may help you to create an appealing environment, but remember that all you really need is your body and your mat. Each time you practice in your yoga space, you will create positive energy vibrations that will strengthen and contribute to the atmosphere. 3. Make your practice a sacred ritual. 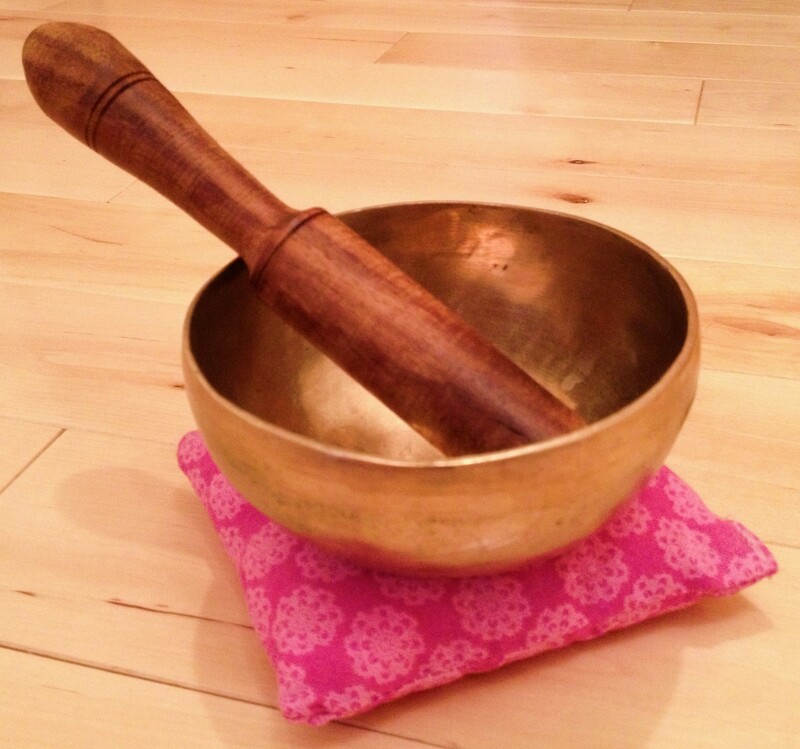 Open and close each practice with a sacred ritual of some sort: you may ring a bell, chant OM, light candles or incense, repeat your favorite mantra, smudge the area with a sage stick, or sanctify the space in any other manner of your choosing. These actions do not physically alter the space, but they shift your awareness into a more reflective and receptive state. When used at the start of practice, they create an energetic boundary between the outside world and your yoga space; and when used at the end of practice, they cleanse the energetic vibrations and allow for a smooth transition into the next activity. These actions also solidify your intention to focus completely on your yoga practice for the designated time period. Make sure to let others around you know that this yoga time is “you” time, and kindly ask them to honor it by not interrupting you, unless it is urgent. Ring a bell to signal the beginning and end of yoga practice. 4. Practice at a convenient time, and practice regularly. Many people find it easier to maintain a regular practice when they practice at the same time every day. Traditional yogis say the best time to practice is in the early morning, before eating breakfast. Others say the evening is best, since it allows you to release the tensions and stress of the day before going to bed. In reality, there is no “wrong” time to practice yoga (except right after a large meal! ), so choose a time that is convenient for you. If you miss your scheduled practice, try to fit in at least a few minutes of yoga sometime during the day – even just some simple stretches while sitting in your desk chair or while lying in bed counts. And if you feel inspired to practice when it’s not your regularly scheduled time, by all means, go for it! Remember to start slow. Just getting yourself onto the mat is often the hardest part of yoga. If you find yourself short on time or energy one day, just sit in your yoga space and breathe deeply for a few minutes. 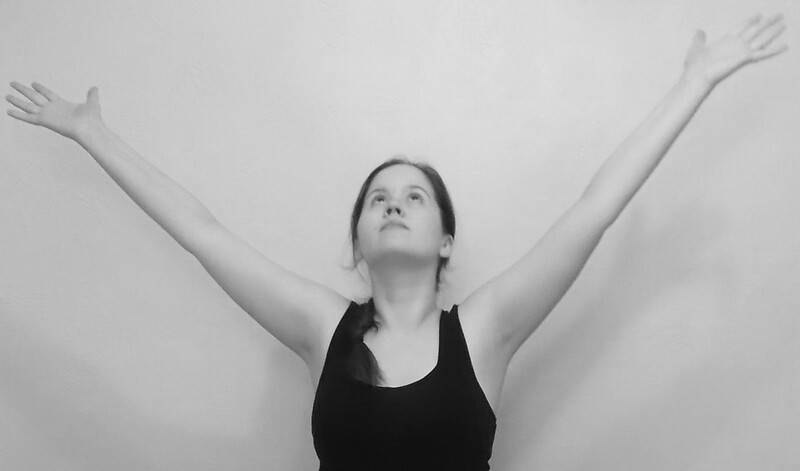 Have a “go to” pose that you enjoy and find easy and restful. After a few minutes, you may feel like doing some more poses, and if not, you will have gotten in about 10 minutes of yoga time. It is much better to do 10 minutes every day than to do 75 minutes once a week. Finish up with a brief (or long) savasana and you’re good to go! Only have time for a “yoga quickie”? Do child’s pose for several minutes, followed by savasana. 5. Decide what poses to do before you start. It’s good to have several different yoga sequences to choose from, based on your mood and energy level. If you have trouble thinking of what poses to do or how to string them together, there are tons of resources out there that can help you, many of them free. You can try YouTube videos, podcasts, apps, DVDs, books, or yoga websites for ideas. Some schools of yoga, such as Ashtanga and Bikram, use the same set of postures every time. This can be a great way to observe the nuances and evolution of your practice. Keeping the poses constant allows you to monitor your own internal changes, day-by-day as well as long-term. One drawback to this method is the potential for injury caused by repetitive movements. Some people can also become bored by doing the same poses over and over. If you choose this method, I recommend alternating the set postures with a restorative practice every other day. If you prefer a more “go with the flow” approach, it’s helpful to have a focus of some sort to tie it all together. It can be an anatomical focus (examples: hip-openers, backbends, arm balances) or a mental focus / intention (examples: letting go of stress, grounding your energy, performing each movement slowly and mindfully.) This will give your practice an overall sense of flow and cohesiveness. Whatever poses you choose to do, never skip savasana! All schools of yoga agree that final relaxation is the most important part of any yoga practice. 6. Keep track of your yoga practice. This can be as simple as marking it down on your calendar each time you practice and for how long. If you are so inclined, I highly recommend starting your own yoga journal to record the details of your practice. Record which poses you did, your mental state, your emotions, and any insights that came to you during your practice. (You may want to write them down as they come to you – I tend to zone out during savasana and forget everything!) 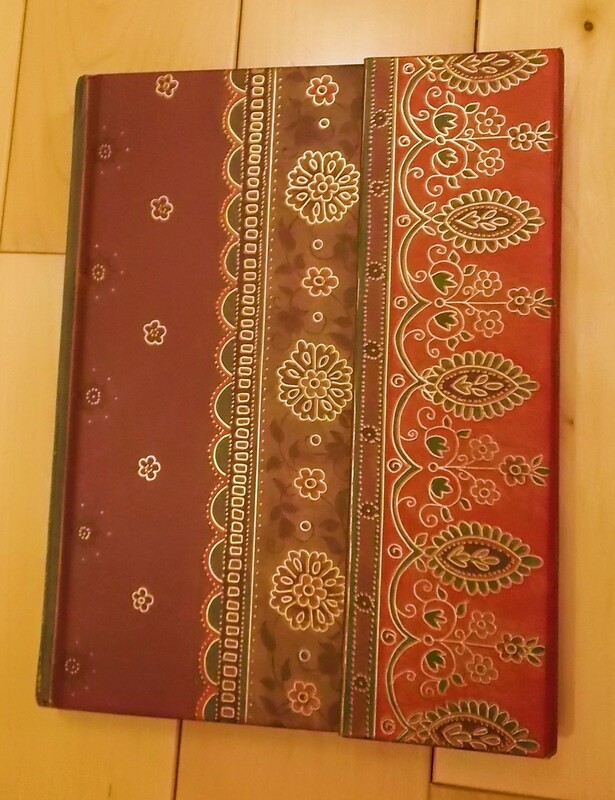 Over time, this journal will become a wonderful record of your personal and spiritual evolution, a veritable goldmine of first-hand LIVED yoga wisdom. Journaling about your yoga practice is a great way to track your progress over time. 7. Listen to your body, and do what works for you. In each pose, pay attention to how your body feels. Focus on finding a relatively comfortable place in the pose, use modifications as necessary, and don’t worry too much if your body doesn’t match up to the picture in the book or on the screen. Never force yourself beyond your limits – doing so is a good way to injure yourself! Instead, find your “edge”, where the pose begins to feel slightly uncomfortable, and remain there. If the sensation becomes more uncomfortable, ease back a bit. On the other hand, if you begin to feel more relaxed, let yourself sink a little further into the pose to find your new “edge”. As you listen to your body, experiment and play with your “edge”, you will begin to figure out what works for you. This will lead to a fulfilling and enjoyable practice that you will want to repeat. The best way to maintain your yoga practice is to HAVE FUN!